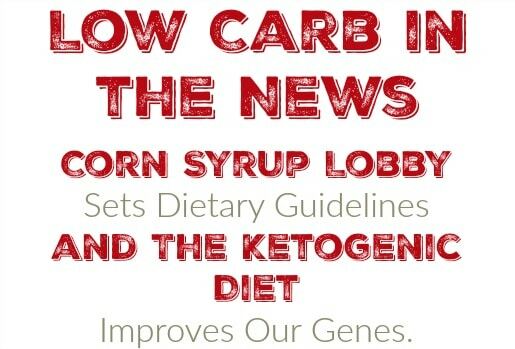 This Week in Low Carb News: Corn Syrup Lobby Sets Dietary Guidelines and The Ketogenic Diet Improves Our Genes. Every week I come across a bunch of articles that I want to bring to your attention and at least comment on but I just can’t seem to find the time. So I think I’m just going to link to the articles once a week and maybe say a few sentences. Hopefully this will clear out the number of open tabs I have on my browser! US News is Wrong About What Constitutes the Best Diet – When Taubes or Tiecholz write something, I read it. When they collaborate on something? Everyone should read it. After the Keto diet came in last on US News’ list of best diets it was only a matter of time before someone pointed out how dumb the list was. That these 2 chose to take it down makes it that much better. Corn Syrup Lobbyist Is Helping Set USDA Dietary Guidelines – To the shock of absolutely no one this White House administration has a pattern of allowing lobbyists into places where they have authority to change policies over the very areas where they lobbied. It’s nuts and it results in things like the corn growers setting our food policies. Guess what they recommend? More “healthy whole-grains” and processed foods with plenty of HFCS. Good grief. High Fat, Low Carb Diet Might Epigenetically Open Up DNA and Improve Mental Ability – It’s only a mouse study but it is an interesting look at how increased BHB can effect gene expression. Makes you wonder exactly what the ketogenic diet is fixing in us at the genetic level that we don’t even know about. The Diabetes Payroll – Insulin is a 95 year old drug so why is it so blasted expensive? It is a must have drug for millions of diabetics so why are there only 3 companies making it? Insulin doesn’t help T2 Diabetics so why is it still being prescribed? They answers probably won’t surprise you. Coke’s Covering Up Payments to CDC and NIH – The obesity epidemic is the greatest threat to our long term survival as a nation (Although the opiate epidemic is giving it a run for its money) but the government organizations in charge of our public health can’t seem to pinpoint the problem. Why is that? Probably because the biggest purveyors of sugar are subsidizing those organizations. PREVIOUS POST Previous post: I Work Out, Should I Be Worried About the Ketogenic Diet? NEXT POST Next post: What Supplements Should I Take on the Ketogenic Diet?